I'm already familiar with Dice Hate Me Games as I own a few games in their catalog. 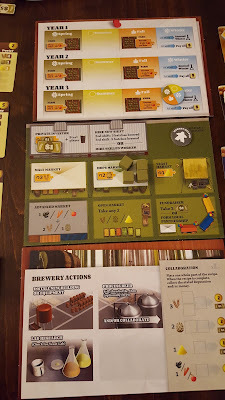 I hadn't yet played Brew Crafters and when it was suggested for me at Gen Con this year I wasn't sure after reading the box summary it would be a game for me because I don't know anything about beer. I don't drink it, I don't buy it, and nothing about processing beer sounded fun to me. But I have a reputation as an objective and thorough reviewer so I wasn't going to let a little thing like total lack of interest stand in my way. This is a worker placement game with your workers being your market action meeples and your shift employees at your brewery. All players start off with two market action meeples and one shift of employees. Each season (spring, summer, fall, winter) i.e. round of the game sees all players completing market and brewery actions using their workers. Both types of actions directly or indirectly lead to gaining reputation points. There are four seasons in a year and there are three years in a game. At the conclusion of the third year, the player with the most reputation points wins the game. Market actions are competitive, meaning if your workers stake the claim to a particular action, no other player's workers can do so that season. Brewery actions are not competitive; they can be selected by any player even if another player has already selected the same action. 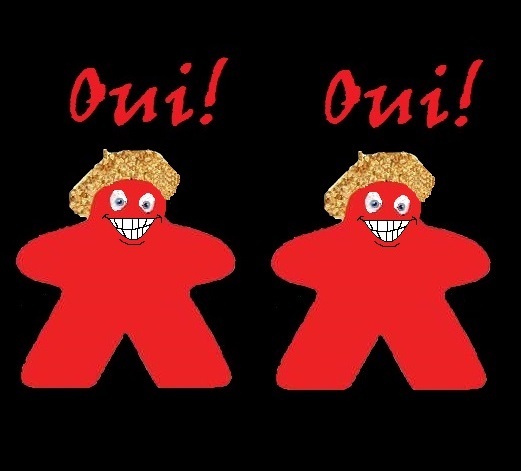 As the game progresses players can amass more workers to place by hiring additional market action meeples (interns) and additional brewery shifts. The market actions allow a player to make strategic business decisions such as developing partnerships to allow for conversions of raw ingredients; buying beer recipe ingredients; hiring skilled employees, interns, or additional shift workers to provide efficiency gains in future market or brewery actions; and raising cash. 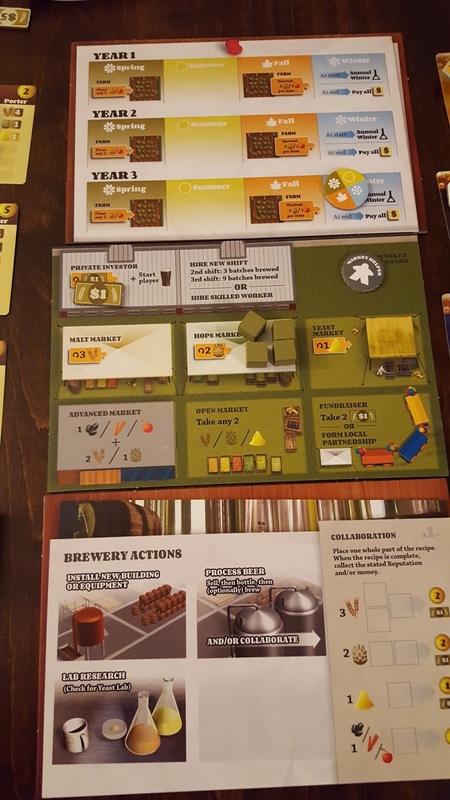 The brewery actions allow a player to choose from operational tasks such as selecting and brewing a type of beer (raises cash and provides for reputation points), installing new equipment to increase brewery efficiency, or conducting research to obtain special benefits. 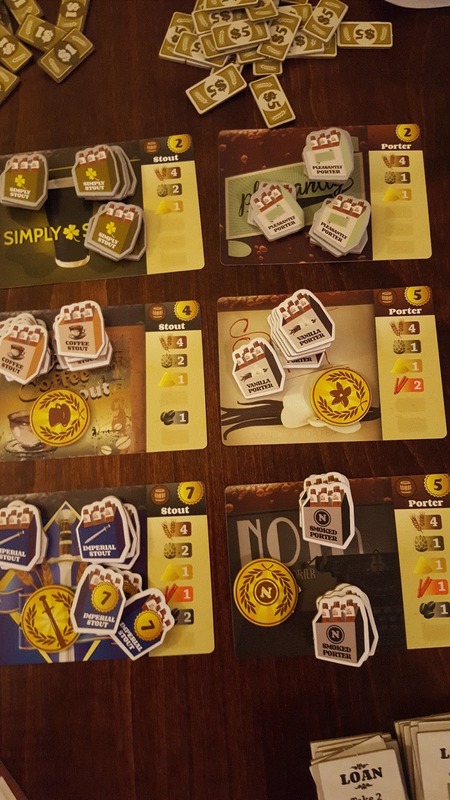 There are three basic beers that are used in every game and a variety of advanced beers that may be selected for brewing included in the game components; a subset of the advanced beers are chosen for each game, providing many possible combinations and great replay ability. There are also special reputation awards given to the first player who brews each kind of advanced beer during a game. In most worker placement games, when you place your workers, you pay an opportunity cost to complete the transaction you've selected them to do. Brew Crafters turns this sequence on its head by requiring players to pay operational costs as the consequence of selected market actions (such as hiring skilled employees) and brewery actions (such as owning additional equipment) at the end of each winter season instead of when you take the actions. I like this clever twist because it give you the ability to take an action now and come up with the cash to pay for it one or two rounds later. If you don't have the money when it's time to pay, you have to take out business loans which cost you reputation points at the end of the game. The components for Brew Crafters are legion (extra bonus points to the publisher for including a large quantity of small bags to store everything neatly). 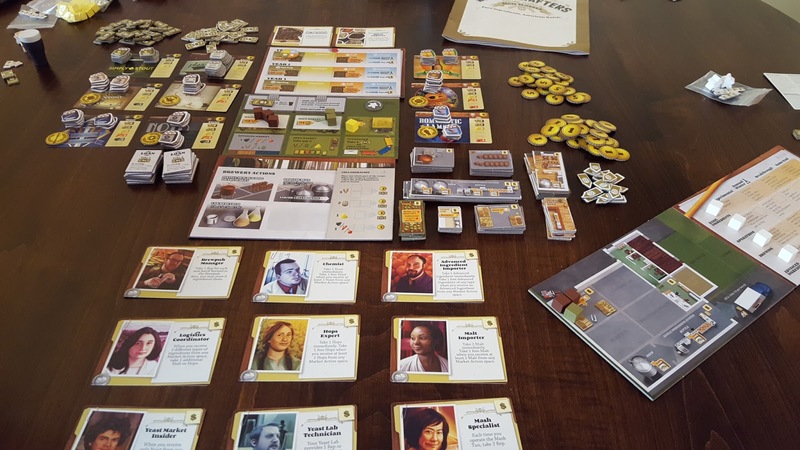 For example, there's market and brewery action boards, the season board, player brewery and research boards, the ingredient cubes, the workers (meeples and shifts), the skilled employee cards, the recipe cards, the reputation tokens, the money, the equipment cards. And let's not forget the 24 sets of adorable little six packs of beer tokens. All of these pieces are sturdy cardboard cutouts, glossy paper cards, or wooden objects and while they should hold up well to long term use, you wouldn't want to leave them alone with your small child or undisciplined puppy. Overall I found the artwork and components to carry the theme well. I am very happy to add this game to my collection and I'll definitely bring it out on game night to introduce it to others as well. Enjoying this game as much as I did also means I'm going to put Viticulture on my play and review consideration list because I have been putting off playing that game for much of the same reasons (I don't drink wine).